For one week I will be focusing on the film "The Apartment." This is the second in a series of articles. There are many rules to writing comedy, but my main rule is: look at what Wilder did. Read it, learn it, practise it, read it again, watch the films, and do them all again fifty times. You're going to get more from this screenplay than from an expensive course. One of the things we see again and again is how something would get planted, in the script, and it would be seemingly meaningless-- but two pages, or sixty pages later, it would provide a laugh. Here's an example. This is a very early exchange between the main character, C.C. Baxter (Jack Lemmon), and one of the executives who is using his apartment for rendezvous with women. 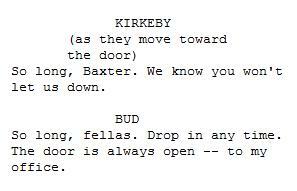 Baxter is referred to as 'Bud' in the script. First let me mention something else. There's a great line there; "You're on your way up, Buddy-boy. And you're practically out of liquor." This is the delightful way Wilder uses language; to point in one direction but then pull you somewhere else. It's delivered as if saying "You're on your way up, and things are going well for you," or something equally mundane, but it's pulled another way, to give more meaning, and humor. This has always been part of Billy Wilder's repertoire. He used a similar device in 'Double Indemnity' when Jackson says "Mr. Keyes, I'm a Medford man - Medford, Oregon. Up in Medford, we take our time making up our minds," and Mr Keyes responds with, "Well, we're not in Medford, we're in a hurry." 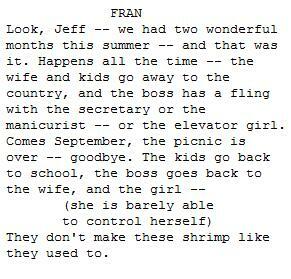 But back to the screenplay sample. 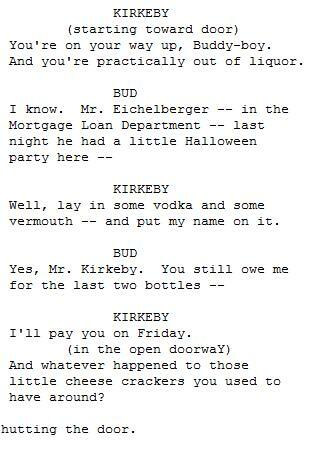 There's a line by Kirkeby about cheese crackers. He's just asking where they are. It's mildly amusing, because we, as an audience, see how put out Baxter is. Not only is he being muscled out of his own apartment by his superiors, but they're demanding cheese crackers. It's funny. But it's funnier a few pages later, when Baxter is desperately trying to talk Dobisch out of bringing a girl to the apartment. The cheese crackers come back, in a throwaway line. 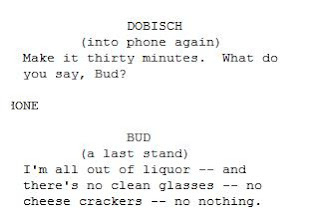 The reader of the script, or audience of the film, don't even remember that they remember cheese crackers, but the joke is funnier because of the previous information. I don't mean to imply this is the greatest joke ever--- but the screenplay is peppered with many of these. In screenplays today, jokes are often obvious, and instant. Or-- if they do plant information, they make sure you know the joke. If the cheese crackers line was written in Hollywood today, they'd probably build it up sixteen times, just to make sure you get it. "Oh, I must remember to get some cheese crackers. Yes, cheese crackers would be good." That's the magic of Wilder and Diamond, they lived by the rule of 2 x 2. They give you the math; but they let you find the answer. They don't need to tell you it's 4, it's more fun if you find it out yourself. One of Wilder's greatest skills, and most used techniques, was to have the characters to say something that meant more than one thing. Most of the time, it would mean one thing to the character it was being said to, but it's meaning was entirely different to C.C. Baxter, and to us, as the audience. 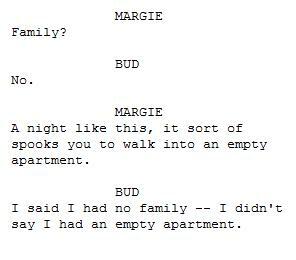 These jokes are peppered throughout the script. You often don't notice them and you often don't realise you found them funny-- but they add layers to the experience. The joke here, again, is about how everyone is using his apartment. Margie has no idea what he's talking about. Billy Wilder cast Jack Lemmon again and again, and only settled on making 'The Apartment' after finding Lemmon and working with him on 'Some Like It Hot.' He found, what he called, his 'everyman.' It takes someone like Jack Lemmon to make these lines work. He doesn't go for the joke, he doesn't add anything to what he's saying--- he just says it. The comedy comes from the banality of the lines. Good comedic writing fails, more often than not, when a director or an actor tries for too much. This can be better explained by a line from the TV show "Studio 60 On The Sunset Strip." To just talk about humor and jokes is to do a huge disservice to the screenplay. The way Wilder and Diamond planted information was used for more than just one-liners about cheese crackers. 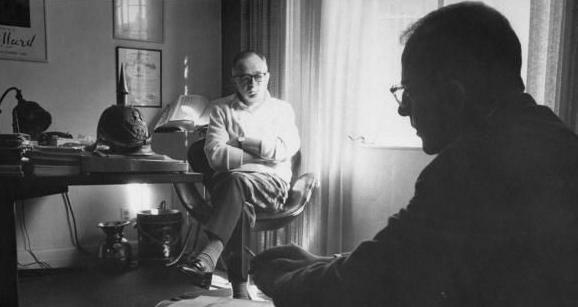 Like I said at the beginning -- reading the script, like watching the film, is a breeze, but that's only because of how expertly the material was written and handled. 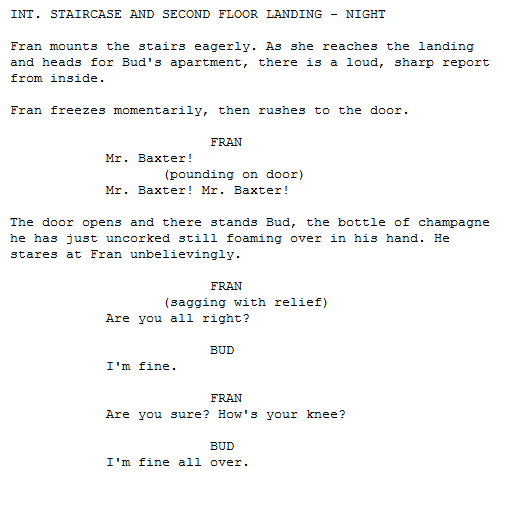 The final act of the film, and how it all comes together; is probably the best screenwriting I have ever read. 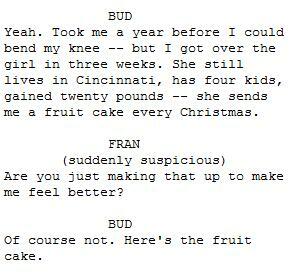 One of the key moments in the film is when Fran Kubelik overdoses on sleeping pills. We know she's having a tough time, and we know she is suicidal. Baxter is still concerned about her mental health; refusing to open a window in-case she jumps, and he comes home one night convinced she has tried something again when he smells gas. But then we have an unexpected twist, a moment which brings the characters closer together. He shares the story of how he tried to kill himself once, but, in a moment of panic - shot himself in the knee. During this scene - we think we know what we're getting. We're getting a laugh, about the knee, and we're getting a bit of understanding between the two characters. They've both been there, they've both been through it. But there's more to come. The champagne is just champagne, it doesn't mean anything to us, the audience. There are many things to say about the ending. But I don't want to spoil absolutely everything for those of you who haven't seen it. Suffice to say; the way in which Fran realizes she wants to be with Baxter is quite wonderful, and the way in which she comes to that realization, with Mr. Sheldrake (Fred MacMurray) is magic in itself. 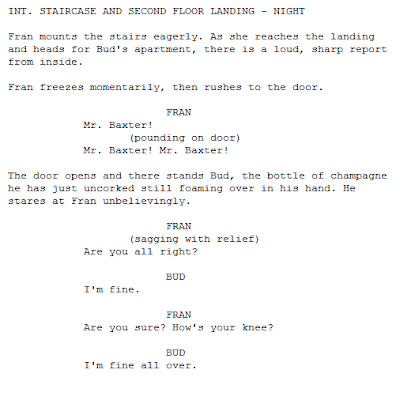 When Fran ran up the staircase and heard a bang -- she thought he'd shot himself. We, too, feared the same. The scene is a repeat of the earlier one where Baxter comes home to find the gas has been left on, only this time, it's the other way around and there's the unmistakable bang of a gun. We don't even realize we knew about the champagne, it was so insignificant. 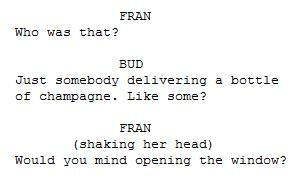 But when we see Bud with the champagne, it all makes sense; we're all relieved as Fran is. It wasn't a gunshot, he was popping champagne. And we even get a 'Wilder' line --- "how is your knee?" 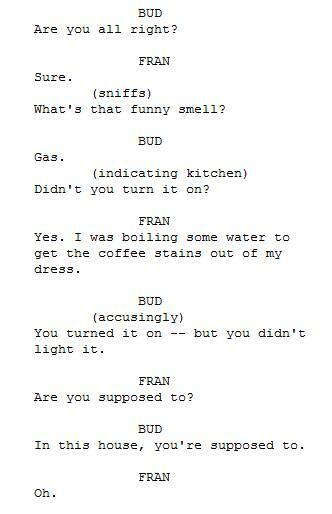 There are about a million things that make this my all time favorite screenplay. The things mentioned in this post are just scratching the surface. I really hope you read it. It's magic, and magic is a rare thing, screenplay-wise, film-wise, and other-wise. Not only would today's Hollywood cram those cheese crackers down your throat, repeatly -- they'd pay Will Ferrell oversell the lines. Thanks for this analysis, Kid. I think I've posted the same sentiment on GITS: "The Apartment" is one of those rare examples of a perfect movie. Billy Wilder & I.A.L. Diamond had it going on there for a while, hit after hit. I'm just catching up on your posts on The Apartment. I am really enjoying your analysis of it. I am trying to write a comedy at the moment and this has made me rethink a couple of angles I have come up with. Which is always a good thing. It's the irony, the word play, the absurdity of our humanness, the timing, the damn cleverness of it all that made these movies great. My young teenage kids watch these movies and laugh hysterically. God I loved Lemmon as Hildy Johnson in The Front Page (another great Wilder film!). But The Apartment is an amazing piece of work. Great series, here! Interesting that the only contempo writing sample you use is from a TV script by Aaron Sorkin. He's one of the few writers today (the only writer?) who specializes in verbal snap and crackle with subtext. See The Social Network in which Sorkin and Fincher (and Trent Reznor) join forces in a work of unexpected brilliance. As for comedy, unfortunately today in mainstream Hollywood, comedy is people being hit in the crotch and screaming. Yup. 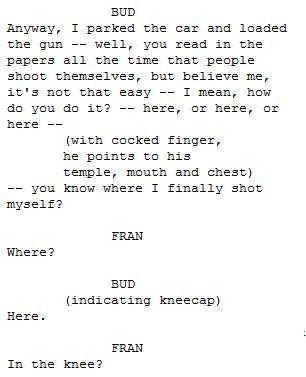 Pretty much the best script ever written. NO contest. It's just perfect. You are write/right. Perfect script and I am so fortunate to own a copy.